Shortbread are sweet, dense, rich Scottish cookies. The dough can also be used as shells for tarts. Traditionally, shortbread was made as one large cookie in a round shape, with notches on the edges to evoke in one’s mind the rays of the sun, particularly for the Winter Solstice. The ingredients are flour, butter and sugar. The standard proportions are 6, 4, and 2: that is to say, 6 oz flour, 4 oz butter, 2 oz sugar, measured by weight. A lot depends on the flour used. Bread flour or Canadian all-purpose flour will present you with more of a challenge in not turning out hard, tough shortbread because of the amount of gluten in those flours. Your chances of success increase by using a flour with a low-gluten content — such as plain flour in the UK, or cake and pastry flour in North America. The higher the fat content in your butter, the better your chances. Canadian consumers have very little choice in butter (at 80% butterfat), but Americans and Brits should look for butters that are 82% and 84% butterfat and up. Ideally, the butter should have minimum 83% butterfat. And the butter must be butter: margarine, shortening or lard won’t fool Mother Nature here. The butter should be at room temperature, though not overly warm. It is hard to make shortbread in warm kitchens, which means it is hard to make it in the summer. Many people, though, at Christmas they could make Shortbread with summer butter, as butter when the cows are out at pasture and not stuck in the barn chewing old hay is tastier in the shortbread. Superfine sugar (aka caster sugar) will help weigh the dice in your favour as well when making Shortbread. Some people sneak in a little rice flour and cornflour (aka cornstarch) as well; they say the rice flour makes the cookie crunchier. Purists say, though, that if you have added anything else beyond flour, butter, and sugar, you may have made something, but it ain’t shortbread. Call it what you want, they say, but don’t call it shortbread. Scots would be scandalized if you suggested tossing in a handful of chocolate chips into the dough, as some American food writers do. To make, you put the butter on the centre of a board, measure the sugar out on top of it, and measure the flour off in one corner. You knead the sugar into the butter. When it is just about all in, you start bringing over and kneading in small amounts of the flour. When the dough is pliable and firm, without being crumbly, you have the right amount of flour in it. Do not overknead. Roll the dough out as thick as you want. Failing all else, a rule of thumb is 2 cm (3/4 inch) thick. You can bake the dough all as one piece in a round, or cut it into fingers. You can also get moulds for shaping shortbread in. The moulds are usually made of wood. You flour the moulds, bang out any excess flour, then press the dough in, and roll it level in the mould with a floured rolling pin, then tap the dough out of the mould. Pricking shortbread dough with a fork allows steam to escape, which would otherwise be trapped and distort the shape. You bake shortbread at 150 C (300 F). At a temperature lower than that, you may end up with a greyish centre; higher than that and you may end up with a white centre. If you want to dust the shortbread with sugar, 5 minutes before it’s done remove it from the oven, sprinkle with superfine (aka caster) sugar, then return to oven for the last 5 minutes. When done, remove from oven, let cool a little, then turn out onto wire rack. Shortbread is presumed to have evolved from Yule bannock sometime in the 1500s. 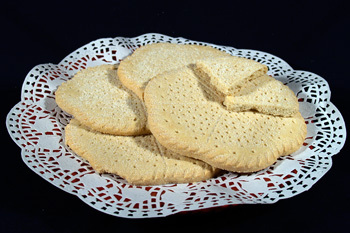 Triangles of Shortbread cut out from a circle (pie-shaped slices) are called “petticoat tails”.